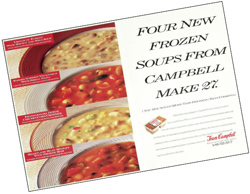 Leverage Campbell Soup reputation and brand image to position the foodservice division frozen soup line as a quality solution for restaurants and institutions. Advertise in key trade publications the value of "Team Campbell" as a partner in menu planning. Feature the innovative soups and convenient packaging. Worked with Campbell Soup in-house photographer to shoot prepared soups with the aid of professional food stylist. Advertising appeared in several key trade publications (Nation's Restaurant News, etc.) and was recognized as #1 in recall scores by an independent readership study. High-end direct response program targeting foodservice decision-makers. Sales organizations need prioritization and focus to achieve sales mission.